There was enough of the sewn together strips that I played with yesterday for the foundations of two postcards. Actually, I made this one before I made the larger piece, "Fading Memories II", to see how the paper napkin leaves would work. This is the first time I've incorporated paper in any quilt. It definitely won't be the last. The acrylic medium coating makes the paper strong, pliable and resistant to moisture. 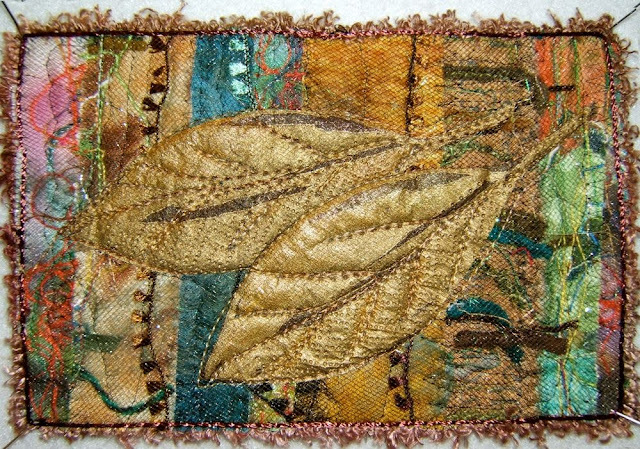 It's difficult to tell that the background for this one is cut from the same hunk as the leaf pieces. Part of it is the overcast hue from the color of the tulle that's layered on top. This one is a bright pink while the other postcard is gold and the bigger piece is a dark brown. Silk flowers and green squiggly yarn decorate this one. 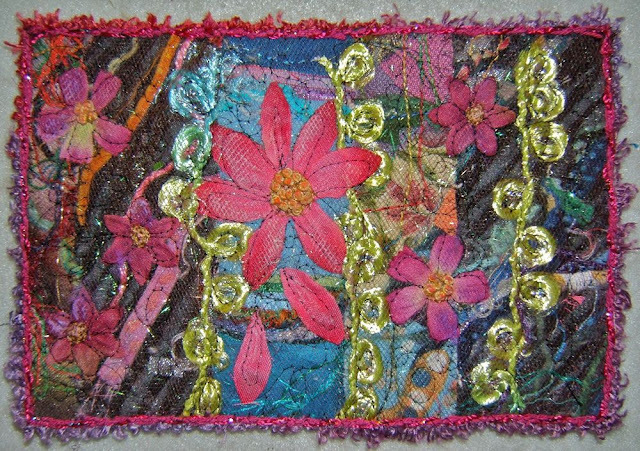 The centers of the flowers have hand and machine embroidered centers. Both of these postcards are destined to the Alzheimer's Art Quilt Initiative sale, too. Awesome Nellie. Can't believe this is just made from scraps. These are so unbelievably perfect and gorgeous! How do you make the edgings? I just love that effect so much! Michele, my favorite edge finish for a lot of art pieces is couched yarn(s). The methods I use can be found in a post that's listed on "Nellie's Tutorials" Page located in my sidebar. Two more little treasures - they are both so beautiful and will be snapped up I'm sure. You should get a prize for recycling your scraps as well as working for charity! Nellie, did you see that your Memories postcard is going in the April auction on the AAQI? Nellie, just wanted to let you know that I am thrilled to be the new owner of your Memories postcard! It is truly a work of art. I hope you don't mind but I plan to do a blog post tomorrow on my "art collection" which includes this piece. I love your work and am proud to own one of your pieces.